This is a discontinued item and is offered at a super-low price. Final Sale. 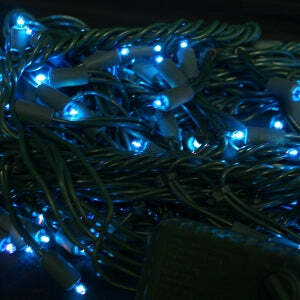 Rated for 10,000 hours of operation these blue lights are great for Christmas, parties and more! Features 140 tiny bulbs, crab-style green wire construction and built 8-way control box for creating great visual effects including fading, sparkle, crawling, steady and more. I find this set to be really versatile for many holidays - the super tiny size really makes an impression. Approximate Total Length 27' 4"
I was searching for a wave motion. These lights have the wave effect but it doesn't stay in that function. After a few seconds they start a different function alternating with the wave. More explanation of the 8 functions would have been helpful. Working well for my sculpture!! I used two sets of these lights for a sculpture I'm creating in regard to the burning culm piles of Northeastern PA. They are glowing beneath the surface and look great!!! A: Sorry, we don't have color changing 12 volt Christmas lights at this time. Q: Do you have these itsy bitsy lights in cool white? I am only seeing them in blue on your site. We are phasing that product line out and the only colors we have are the sets shown online. These are incandescent lights so they would come in a standard white instead of cool or warm.